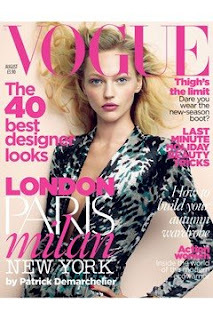 Sasha Pivovarova grabs the August issue of Vogue UK in leopard print Balenciaga. Not my favorite cover out, but still notable. Plus, the magazine covers the Met ball, which after all of the internet, blog, magazine coverage, it feels way over now. The magazine also asks the question, "Dare you wear the new-season boot? "...meaning the thigh high..and if you've been following my blog recently I don't think you need me to answer that question.